Started in 1969 by Clayton J. Britt, Spa and Pool World by Clayton Britt & Sons has been building custom, inground concrete swimming pools in Fayetteville and the surrounding areas for 50 years. The name Spa and Pool World by Clayton Britt and Sons, Inc., is syn­onymous with craftsmanship, service, and long summer days of fun in the Carolina sunshine. 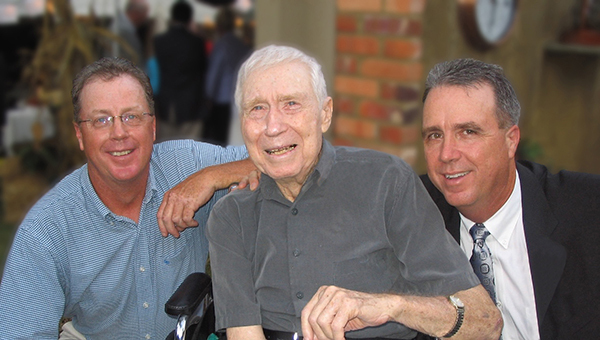 In 2016 the Britt family lost their patriarch and company founder, Clayton Joseph Britt, the “Sons,” co-owners Ricky and John Britt, are forging ahead with a renewed sense of commitment, workmanship and legacy in the industry. Clayton Britt created a small construction all those years ago that has evolved into a successful multi-functional operation under John and Ricky’s leadership. Custom Pool Design and Construction: Spa and Pool World by Clayton Britt and Sons specializes in luxurious residential projects and custom commer­cial pool developments spanning central and southeastern North Car­olina. Distinguished as a leader in swimming pool construction, our company is set apart from the others by our drive to surpass every expectation of our customers, no matter how large or small the job. We are more than happy to work with your current architect, landscape designer or general contractor to help fulfill their design and your vision. We maintain the highest standards of quality workmanship and design creativity while providing exceptional one-on-one service. Let us build the swimming pool of your dreams, right in your own backyard. Retail Store and Showroom: The Britt Sons have expanded their Bragg Boulevard showroom into a complete spa, pool, and backyard fun specialty retail store. The retail store provides swimming pool equipment, supplies and excellent customer service, making us the complete source for all your pool and spa needs. We offer safety and maintenance equipment, pool equipment parts, chemicals for pool and spa, toys, games, above ground pools, portable spas and more. We offer computerized water testing; customers can bring in a sample of their pool or spa water and we’ll let them know exactly what they need to do to bring the water into perfect balance. Maintenance and Service: If it’s swimming pool equipment service or repairs you need, look no further! Our knowledgeable service team is available to satisfy all your pool service needs – evaluations, repairs, pool opening/closings and weekly cleanings are just a few of the services we provide. The service and maintenance team keep Britt pools looking and running their very best year-round. The Britt Brothers are the pinnacle of today’s small business: a fami­ly-owned, committed, hardworking partnership that ensures quality, integrity, excellence, and satisfaction are solidified with their compa­ny’s name. Spa and Pool World by Clayton Britt and Sons, Inc., bringing families together one pool at a time.